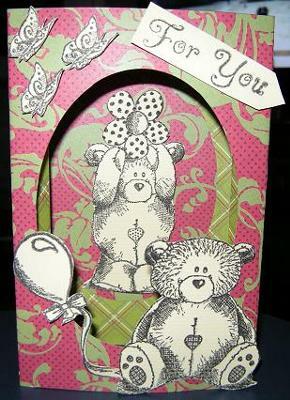 This card was made using a template, the stamps are from the new range called Daisy and Dandelion which were coloured in with copics. Thank you so much for sharing your card, Andrea. It is very cute! I love all the details on it and the way you cut out your images - that gives it so much depth! I can just imagine how it would look opened out as there are obviously more layers to be seen - intriguing! This card is so nice!!! I like it. I love the colours you have used and the stamps.